This elegant dessert is perfect for spring. It’s both fun to make and surprisingly easy, as there is no baking involved. 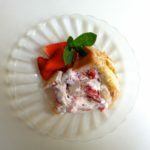 The mold is lined with flavored ladyfingers and filled with strawberries and whipped cream. When it sets, you can decorate the top with extra strawberries, and perhaps a sprig of mint. If possible, use a slope-sided charlotte mold. They come in all sizes, and here in France are generally made of aluminum. 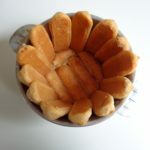 Lacking a charlotte mold, you can use a spring-form cake pan (but you will have to double or triple the recipe), a soufflé dish or a deep-sided bowl. The ladyfingers will be dipped in flavored liquid before being placed in the mold. Crème de cassis is delightful as flavoring, while rum is more traditional — both need to be diluted in water. For the younger generation, use non-alcoholic strawberry syrup instead. This is widely available in France. To make your own, simply mash up some extra strawberries, sweeten with sugar and drain through a sieve to collect the juice. The ingredients below will fill a 4-cup (1-liter) charlotte mold. The number of ladyfingers required will depend on their width and the size of your mold. A word to the wise: buy more than you think you will need. Place a bowl in the fridge to chill. 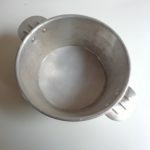 You will use this bowl for whipping the cream. Prepare your charlotte mold. Place the mold right-side up over a sheet of parchment paper. Draw a circle around the bottom. Cut out the circle and place it inside the mold. This will make it easier to unmold the dessert. Set aside 4-5 strawberries for decorating the charlotte. Rinse the rest of the strawberries, drain well and remove the stems. Quarter lengthwise. Add 1/4 cup sugar. Set aside. Whip the cream in your chilled bowl. When it starts to firm up, add the rest of the sugar (1/4 cup). Whip until very firm. Set aside. Mix the water and flavoring together in a shallow bowl. You will now line the sides and bottom of the mold with dipped ladyfingers, Dip the ladyfingers, one at a time, very quickly into the flavored sauce, first one side and then the other. Begin by lining the sides of the mold, fitting the ladyfingers in tightly against each other. Then line the bottom — you will probably have to cut or tear one or two ladyfingers to achieve this. Gently fold the whipped cream into the strawberries. Fill the mold halfway up. Add a horizontal layer of dipped ladyfingers. Add the rest of the strawberry mixture, then top with a final layer of ladyfingers. Place a large plate over the mold and set a weight on it to help consolidate the cake while it is chilling. This can be a small milk or juice carton, a packet of rice or dried beans, etc. To unmold the charlotte, run a knife around the edge, then place a serving plate over the cake and invert it. Tap the top of the mold with a knife before lifting it off. Remove the parchment paper. 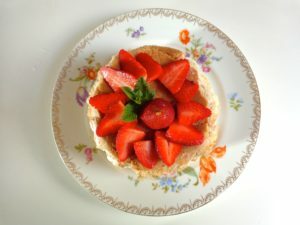 Decorate the charlotte with the reserved strawberries and a sprig of mint. Serves 4-6. Please note: There are many methods for making a charlotte, some of which use gelatin. I have chosen this more traditional method because it is much easier, and just as delicious.